Talakadu (also known as Talakad) is a town on the banks of the Kaveri river, Karnataka, India. The place is known for temples submerged in sand. It is said to have around 30+ temples under sand. It is surprising to see the geology out here. The powerful Kaveri had helped create the dune like area. There is a little bit of history here, blended with some geology and topped with legends and myths. The bit of history is associated to the place is tied to the Mysore Raja Family of this palace. You can read further about the legend here at wikipedia. This weeks shot is one of the excavated temples, along with the intricate stonework, laid out beautifully in front. It is amazing that the work on the stones still look intact! @Shree – Yeah very true, very well preserved. It looks like a live museum where u can touch and feel the artifacts, just unearthed and out there to be explored. This is great. What an awesome place. I am headed here next year as part of my backpacking trip! Can’t wait to see this stuff! It is indeed an awesome place. 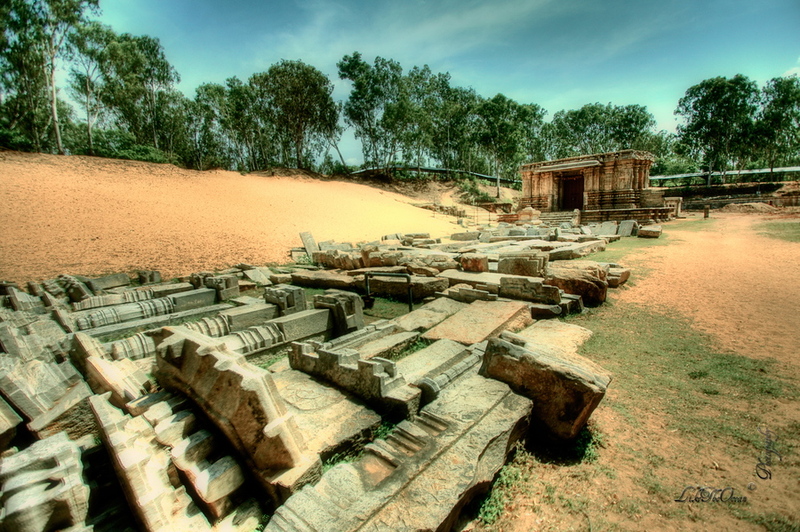 Don’t miss out on Hampi too when you are at south India if you are looking for ancient architecture ! Awesome shot you have here!